We invite you to take your country holiday in our very special self-catering accommodation near Exeter, Devon where the Fursdon family has lived for more than 750 years. 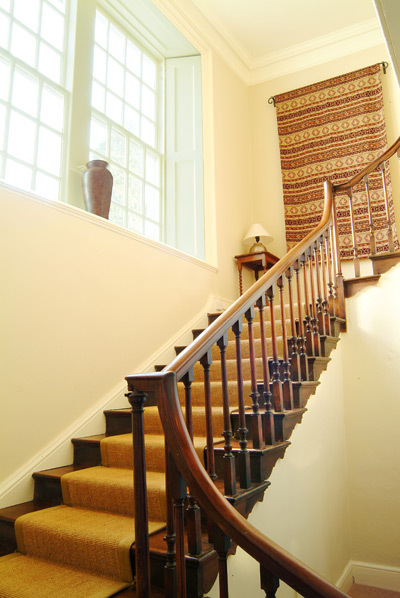 Walk through the cobbled courtyard and up the wide oak staircase to reach the Park Wing and Garden Wing apartments on the first floor of historic Fursdon House. We have taken great care to preserve the traditional feel of a historic country house but your 21st century comfort is important too! The elegant and spacious family sized Park Wing has spectacular views over traditional parkland and beyond to Dartmoor. By contrast the Garden Wing is almost like a self-contained cottage for two within a lovely walled garden. Luxury Fursdon Cottage is a short walk from the manor house and covered in wisteria and climbing roses.Its style is a happy balance between traditional and modern. Catriona has taken great care in choosing colours, fabrics and flooring to create a relaxed and welcoming atmosphere. Come and stay for short breaks long weekends or longer.